Haymeadow Apartments is a pet-friendly community. And in this month&apos;s issue of Living Wise, we give you steps on how you can clean up pet urine and lessen the chances of stains or smells. Because, let&apos;s face it, with pets come the occaisonal mess! 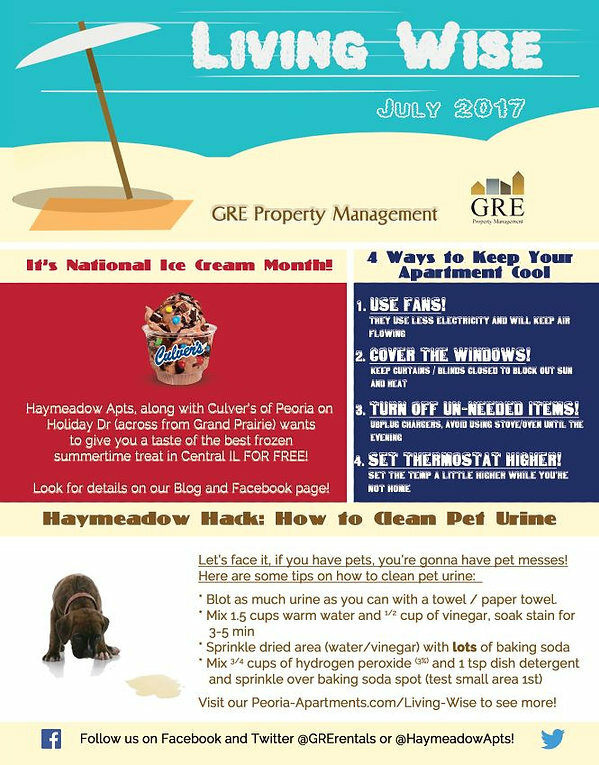 And since it&apos;s July, we also have some tips on how to save energy costs while still keeping cool this summer! Speaking of keeping cool, if you&apos;re love sweet frozen treats, we will have your chance to win FREE Culver&apos;s custard just in time for National Ice Cream Day! Keep following us on Facebook and Twitter, and make sure you keep reading our Living Wise blog for details on how YOU can get your hands (or lips) on this sweet frozen treat simply by telling us what your favorite Culver&apos;s flavors are! Thanks for reading and sharing! And if you have topics or items to share, please email us today at contact@grerentals.com!